When I reached out to my readers in search of foods native to Adapazar, no one responded – until now. Grace Haronian, from Connecticut, told me her maternal grandmother hailed from Adapazar, however, she didn’t really know what recipes represented that area with the exception of one - zucchini pancakes. “My mother's mother (Knar Tutunjian-Marashian) is from Adapazar. I don't know what foods are specific to that area. However, one thing I love (and I don't see on your list of recipes) is a zucchini pancake that she used to make. It is a simple mixture of flour, eggs, grated zucchini, grated onions, salt, and a little baking powder, pan fried in olive oil. And, like so many Armenian foods, you can eat it hot or cold. (My grandmother) also used Swiss chard when making dolma, in addition to the usual tomatoes, peppers, and zucchini." 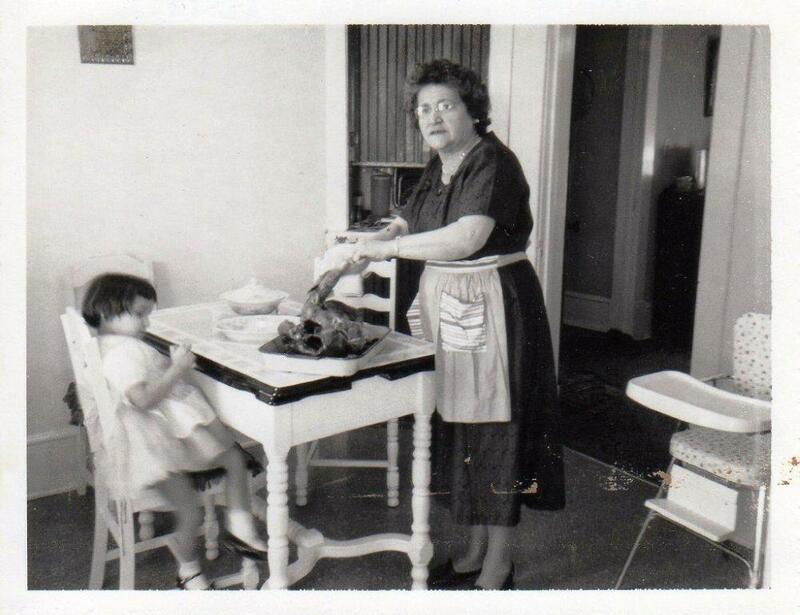 In the photo: Grandmother Knar, feeding her grandchildren in Massena, NY. 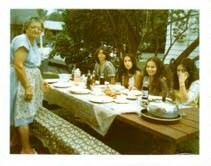 Grace Haronian is 2nd from the right, circa 1973. After reading the note from Grace, I dusted off a zucchini pancake recipe I've had for years, and e-mailed it to her. Grace responded with: “Yes, this recipe sounds very similar to what my grandmother made. So delicious! Of course, I don't have measurements. Medzmair said she cooked "by eye" - "achke chop". Read more about Grace's family below this recipe. NOTE: Feel free to add your favorite seasonings to the batter for added flair. 1. Rinse and gently scrub squash; do not peel. Pat dry. Remove both ends of the squash and grate. Place grated zucchini and onion in a colander and press to squeeze out as much excess moisture as possible. 2. In a mixing bowl, combine the zucchini, onion, eggs, parsley (if using), flour, baking powder, salt and pepper until well-blended. 3. Add enough olive oil in a skillet to coat the bottom. When hot, spoon about 2 Tbsp. of the mixture for each pancake into the skillet and flatten. Do not crowd the skillet. Cook 3 to 5 minutes on each side, or until golden brown. Add oil as needed. Continue until all of the mixture is used. Drain pancakes on a plate lined with paper towels. 4. Serve hot or at room temperature. May be served with a dollop of plain yogurt or *yogurt-garlic sauce. Grace was kind enough to share a little family history. Her mother, Ardell Marashian Haronian, was just three years old when she was brought to America in 1927 by her widowed mother and Grace's great-grandmother. The family settled in Massena, New York, along the Canadian border. 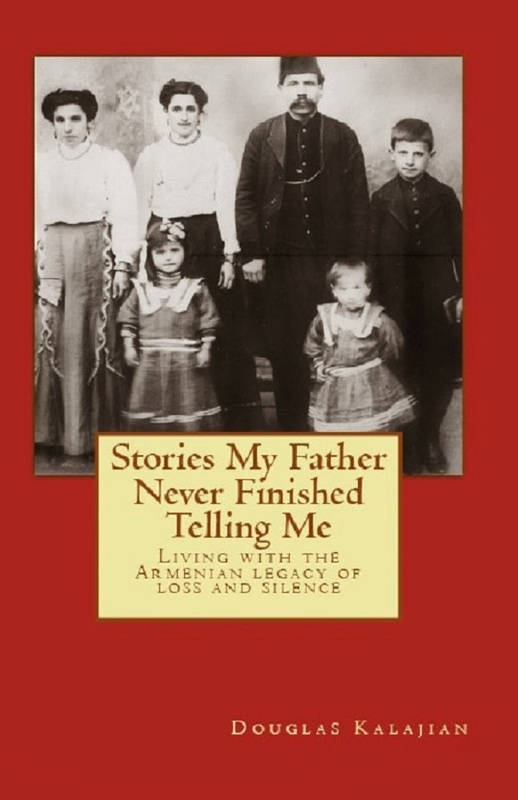 "There was a strong community of Armenians there," Grace wrote. "I think they were primarily attracted to the area because of work in the aluminum plants. My grandmother remarried and spent the rest of her life in Massena, until she died in 1990." Grace's mother moved to New Jersey after getting married. That's where Grace gew up. 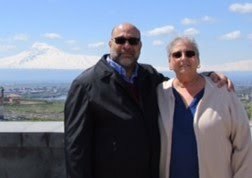 "But, every summer we visited Massena and enjoyed some really good Armenian cooking. I even remembered watching my grandmother make filo dough with a broomstick. I have never been braved enough to try that trick." Along with the memories, Grace included a few pictures. 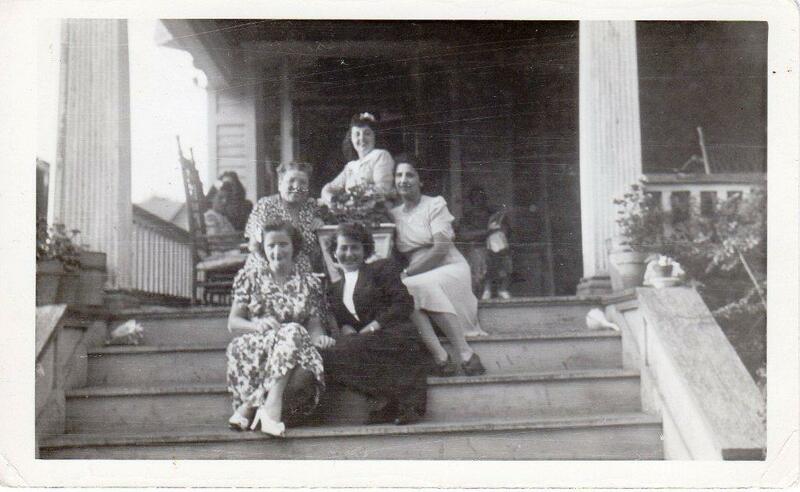 That's her grandmother, Knar Tutunjian Marashian, at her familiar place in the kitchen with one of Grace's cousins -- and a family photo on the steps of the Hye Hotel in Asbury Park, NJ. What a small world. Grace is one of my very favorite people in the whole world. We share the same grandkids!!! She sent me the link to this article and I loved it. Recipe sounds delicious. My Grandmother was Polish so I do know a bit about ethnic foods and heritage. Loved the post. Great post....this is also made throughout the Levant as well in almost every home(lebanon,syria,palestine,jordan) under various names..ijjet koosa,mshaat koosa, often this is made with the left over cored flesh of zuccini when stuffing but most love it whenever, ..some add finely chopped green onion( the light part), and fresh mint ,allspice, but lots of parsley is a must.. This is a wonderful recipe and I have made it several times. My great aunt, Eunice Movsesian Kourian, was from Adapazar and graduated from the Armenian Girls High School in 1907. I have proudly framed her diploma. The pancakes freeze very well and since I make a huge batch I need to freeze them. Thank you so much for this recipe! thanks for posting this zucchini pattie recipe..my mother used to makes these and never wrote the measurements down..she was a great cook and baker as were my aunts all of whom were born in Kayseri Turkey around 1914..everthing was eye measurement..look for for more recipes in the future and just wish I could share these on Pinterest...Happy New Year..
Grace passed away this week after a courageous battle with cancer at age 54. It warmed her heart to connect with all of you at this site. As her husband, I thank you for that. We are saddened to learn of Grace's passing. Meeting her last summer, sitting on the front porch at the Jersey shore, sharing family stories and recipes was a true delight.